A nearly 6,000-pound care package is on its way to the International Space Station aboard a SpaceX Dragon spacecraft. 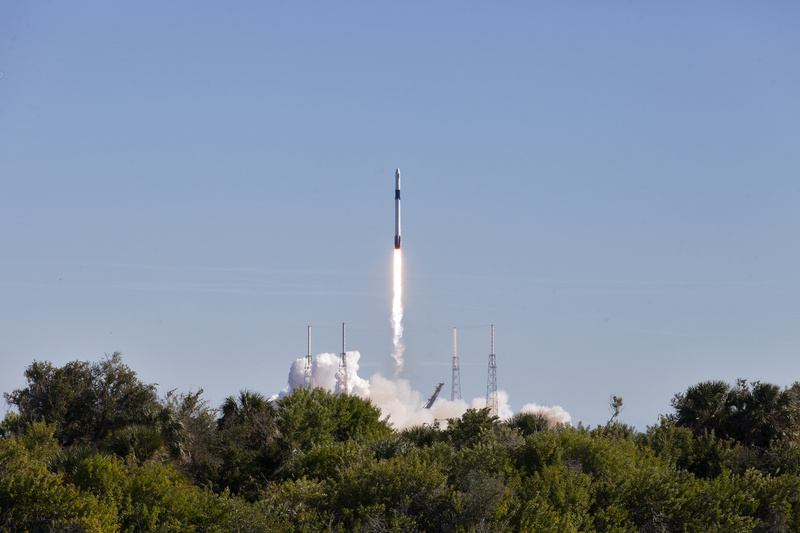 The company’s 16th commercial cargo mission to resupply the space station began at 1:16 p.m. EST on Dec. 5, 2018, with liftoff aboard a SpaceX Falcon 9 rocket from Space Launch Complex 40 at Cape Canaveral Air Force Station in Florida. After a successful climb into space, the Dragon spacecraft now is in orbit with its solar arrays deployed and drawing power. “This is a great day. We had a beautiful launch.” said Hans Koenigsmann, vice president of Build and Flight Reliability at SpaceX. The Dragon spacecraft will deliver science, supplies and hardware to the orbiting laboratory. Science experiments include the Robotic Refueling Mission 3 (RRM3) and the Global Ecosystem Dynamics Investigation (GEDI). RRM3 demonstrates the storage and transfer of cryogenic fluid, which is critical for propulsion and life support systems in space. While the Robotic Refueling Mission Phase 2 (RRM2) demonstrated tasks leading up to coolant replenishment, the actual transfer of cryogenic fluid in orbit will be carried out for the first time with RRM3, using liquid methane. GEDI will make high-quality laser ranging observations of Earth’s forests and topography required to advance the understanding of important carbon and water cycling processes, biodiversity and habitat. GEDI will be mounted on the Japanese Experiment Module’s Exposed Facility and will provide the first high-resolution observations of forest vertical structure at a global scale. Also, the Growth of Large, Perfect Protein Crystals for Neutron Crystallography (Perfect Crystals) crystallizes an antioxidant protein found inside the human body to analyze its shape. This research may shed light on how the protein helps protect the human body from ionizing radiation and oxidants created as a byproduct of metabolism. For best results, analysis requires large crystals with minimal imperfections, which are more easily produced in the microgravity environment of the space station. Hardware for the station includes Orbital Replacement Unit #2, an additional spare required for sufficient gas analysis capability; an external high definition camera assembly; two oxygen tanks necessary to support upcoming spacewalks as well as nominal operations; a Microgravity Science Glovebox video drawer to support further payload operations in orbit; and a rodent research transport assembly and support hardware to support operations for Rodent Research-8. Live coverage of the rendezvous and capture will air on NASA Television and the agency’s website beginning at 4:30 a.m. Saturday, Dec 8. Installation coverage is set to begin at 7:30 a.m. Astronauts aboard the station will capture the Dragon using the space station’s robotic arm and then install it on the station’s Harmony module. The Dragon spacecraft will spend about five weeks attached to the space station, returning to Earth in January 2019, with more than 4,000 pounds of research, hardware and crew supplies. For updates during the mission, visit https://www.nasa.gov/commercialresupply.